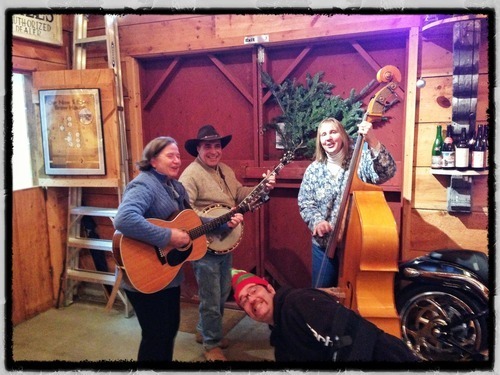 December snow & Stable Hands bluegrass. — Tree House Brewing Co.
December snow & Stable Hands bluegrass. What do those two things have in common? They were the prevailing theme yesterday at Tree House. There is a lot to get excited about for next weekend. ”Julius” will be available on Saturday, and his bigger brother “King Julius” will also be available. What the heck is “King Julius”? It’s an 8.1% double ipa with a recipe that mirrors the original “Julius” with a few small changes. It utilizes about 1/3 more American Hops and is crafted to be slightly drier. If the fermenter sample is any indication, you won’t want to miss this. On sale next Saturday at 11 AM, with a 2 bottle limit. We’re making it a goal to always have a pale hoppy beer on tap. What do you think?